Anyone exasperated with continuous Brexit questions and relentless bewilderment as to what on earth is going on can breathe a sigh of relief today at PMQs. Unlike the last several weeks the leader of the opposition changed tact and tackled the reality of modern day Britain. A country plagued with the outcome of nearly ten years of punishing austerity policies. 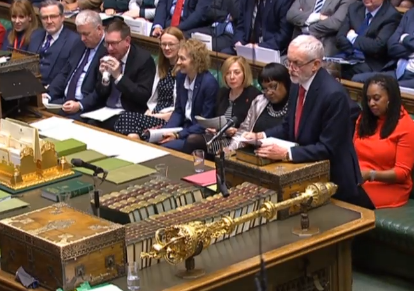 All six of Mr Corbyn’s questions related to the struggles that the people are facing under this Conservative Government, highlighting the increasing numbers of pensioners, children and working people in poverty. Topics which are increasingly being ignored due to the never-ending crisis that is Brexit. This is where Corbyn shines because his questions are heartfelt and he genuinely cares about people, he wants to make life better for people and put an end to poverty. His questions were well researched and shone a light on the problems facing many in the UK. Theresa May seemed relieved not to be hearing the same tired Brexit questions, that she has practised so hard to avoid answering. Although she became visibly uncomfortable stuttering through her answers, perhaps missing the soundbite that the Torys have reduced absolute child poverty, when figures released last week show that five-hundred-thousand more children are in absolute poverty. Denial and soundbites were increasingly employed by the PM, stating that the best way out of poverty is through work. She even went as far to brag that someone working full-time on minimum wage would earn 13k a year due to this government. It was good to see the Labour leader listing the positive achievements of the last Labour government after what feels like years of attacks from the PM blaming the previous Labour Government for all of the ills affecting the country. Which is getting harder and harder to believe when nearly a decade has passed and by all statistical comparison, poverty, homelessness and public services are worse. Members of the PMs own cabinet went on to berate her for initiating talks with Jeremy Corbyn over Brexit but perhaps the most slanderous question of the session was shared on Twitter by BBC Politics. This particular post shared a clip of Conservative MP Dr Caroline Johnson who said. “What is a greater risk to the UK, a no-deal Brexit, versus the risk of letting down the country and ushering in a Marxist, anti-Semite-led government?” On the day that a video of the armed forces shooting a target picture featuring Jeremy Corbyn circulated via social media. This was also after the PM herself accused Mr Corbyn of siding with Vladimir Putin over Salisbury. This statement is untrue, in actuality, Mr Corbyn demanded to see evidence before action was taken. Her statement may as well have been accusing him of being a traitor. Parliamentary privilege is clearly being abused and one would hope that the speaker will ask them to retract these spurious accusations especially in light of the volatile political environment.